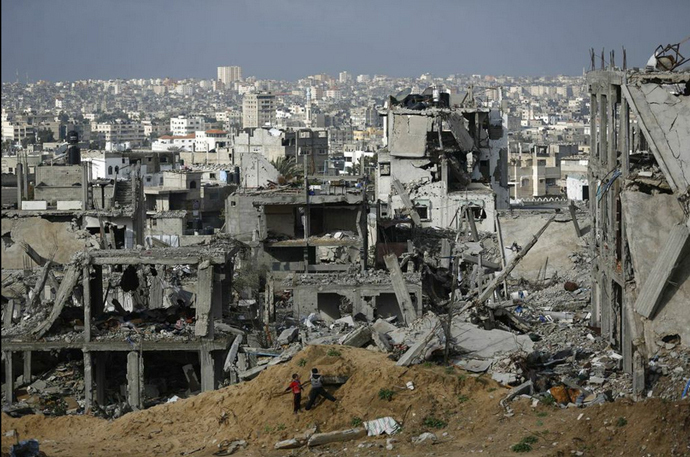 Despite the ceasefire in September 2014 vital reconstruction has barely begun and the Israeli blockade of Gaza remains in place. 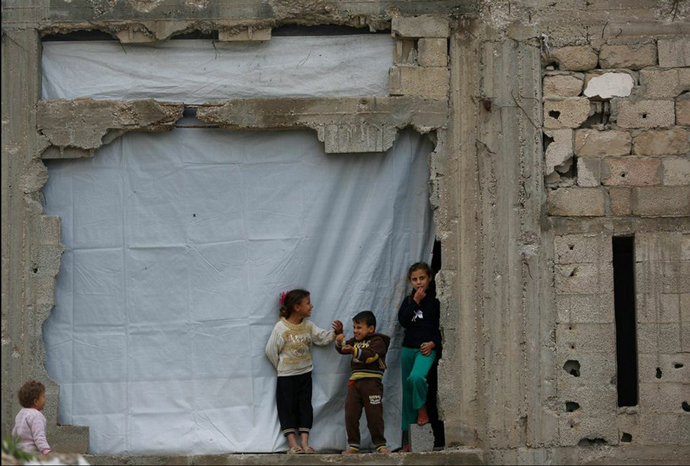 Young children at their badly damaged home, its missing wall covered with tarpaulin. More than 100,000 homes were damaged during the bombing. The storm Huda hit the Middle East during the weeks of January. 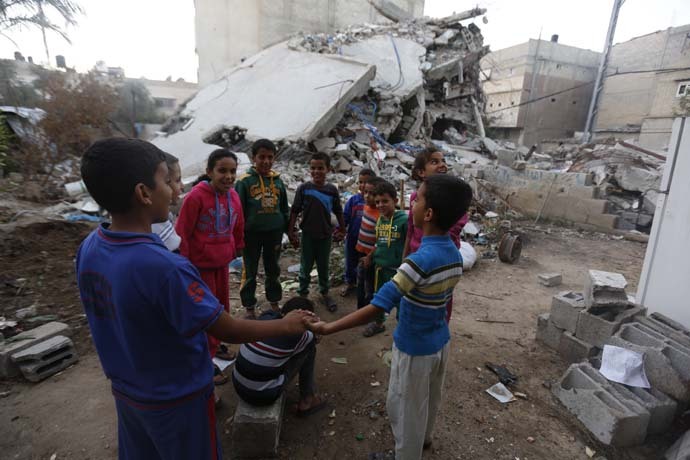 Children in Gaza try to keep warm on the rubble of a house destroyed in the bombing. 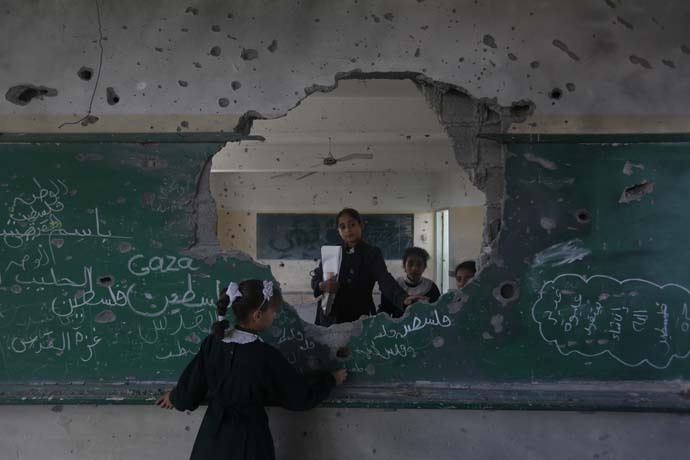 11 year old Manar and her friends at their damaged school in Gaza, in December. During the conflict Manar and her family fled their house, which was completely destroyed. "I lost everything I love in the house. My happiness went under the rubble. I hoped to find some of my happiness in my school, but on my first day back the damage shocked and scared me. The classes are overcrowded and the water leaks in when it rains. But I love my school. Having a proper house and school again might help me to forget all the bad days I've lived through since the war." For the past three months, 26 year old Asma'a has spent her days in a tent on top of the pile of rubble that used to be her dream home. "It was beautiful. I considered myself the queen of my house," she says. At night Asma'a and her two young children sleep in her parents' small, crowded house. "There is not enough space for all of us, so my husband sleeps in his brother's caravan. In the day I come to the tent. I cook and my kids play around me on the rubble. I worry about them as it's not safe. I try to live normally, but this can never be normal. These are not acceptable conditions for human beings. I feel that I am losing my dignity here every day." During the conflict Oxfam delivered more than 50,000 cubic meters of safe drinking water to Asma'a and other families who lost their homes in the neighborhood of Khuza'a. 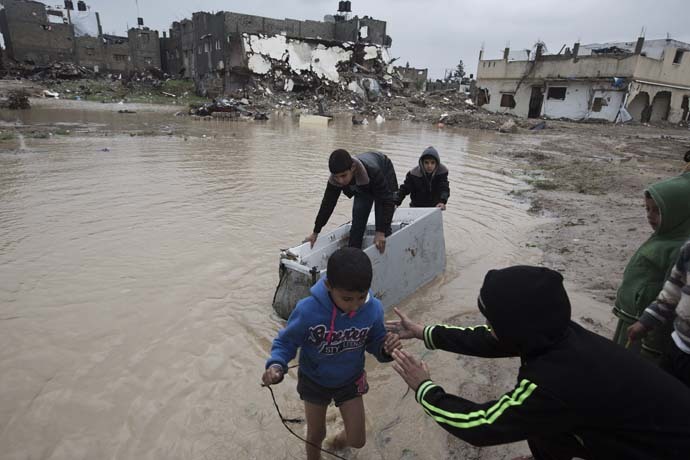 There has already been severe flooding in some parts of Gaza due to the heavy winter rains – like in this photo taken in December. Many families are living in makeshift shelters with no heating or running water as temperatures drop. Most areas face power cuts of 12 hours a day. 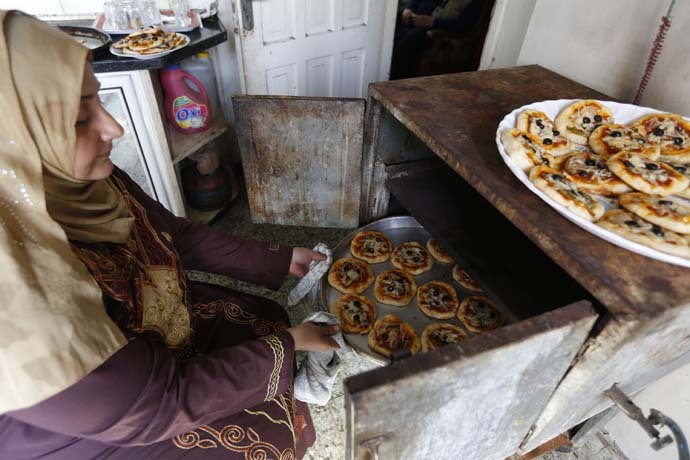 In recent years, life got so tough for Basma Abu Jarad and her husband Ahmed that they had to sell their furniture to buy food. 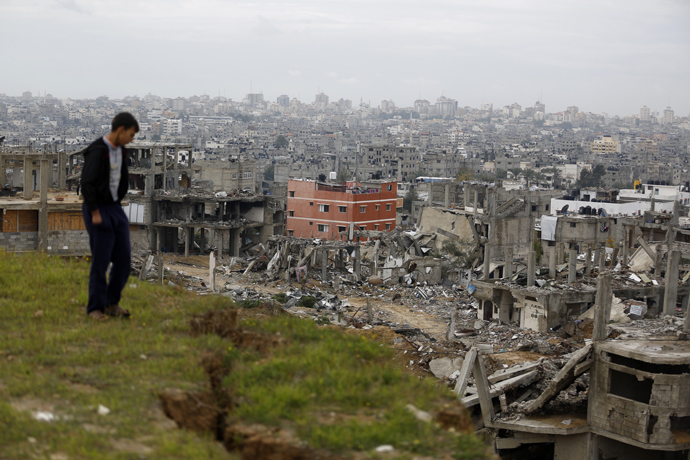 Ahmed had a job in a fuel station, but work dried up after the blockade was imposed on Gaza. Later he was diagnosed with cancer, preventing him from working. Drowning in debt, they depended on relatives and friends to help put food on the table. This year Basma received 10 monthly payments as part of Oxfam's "Unconditional Cash Transfer" project. She set up a small business, making pastries and pizza and selling them in the street in front of her house and helping the family through their most difficult period. The business was going well, but during the heavy bombing few people were able to go out and the business was put on hold. With the ceasefire in place she is now gradually resuming work, but the family's situation remains precarious. Abdelrahman and Naji Wahdan are two brothers who were born to be farmers - it's the only thing they know and love, and their main source of income. During the recent conflict, their farm was bombed, 250 of their beehives were destroyed and 100 of their sheep were killed. "This is the fifth time my land has been destroyed," says Abdelrahman. 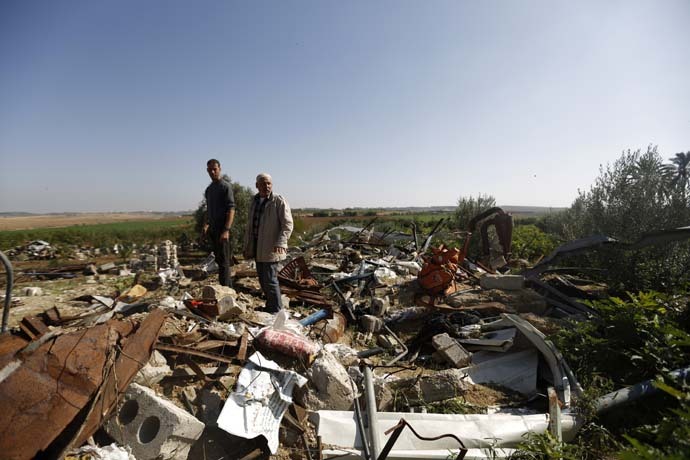 They have struggled for years due to the blockade - prevented from accessing their land near the edge of the Gaza Strip, where farmers have frequently been shot at while working, and prevented from selling their fruits and vegetables in markets in the West Bank. "After seven years of blockade and three wars, I don’t know whether I still have the strength to continue,” he says. "We are frustrated and worried. There is no indication that the blockade will end soon and the war will not come again." Oxfam is helping farmers to rehabilitate their land and access vital irrigation, seedlings and fertilizers. Ismail Abedrabo is a vet working with Oxfam partner UAWC. 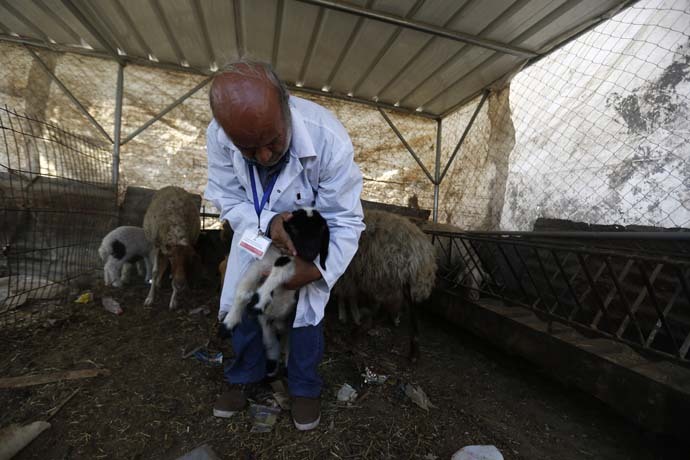 He says the impact of the war will affect herders for a long time to come: "60 percent of the livestock in northern Gaza have been killed or lost. We have seen seven types of disease spread among the surviving animals due to the lack of food and dehydration during the conflict. Miscarriages among pregnant animals have increased." Oxfam supports Bedouin herders by providing veterinary care and fodder for their animals. While many homes were completely destroyed, tens of thousands more people are living in severely damaged homes. 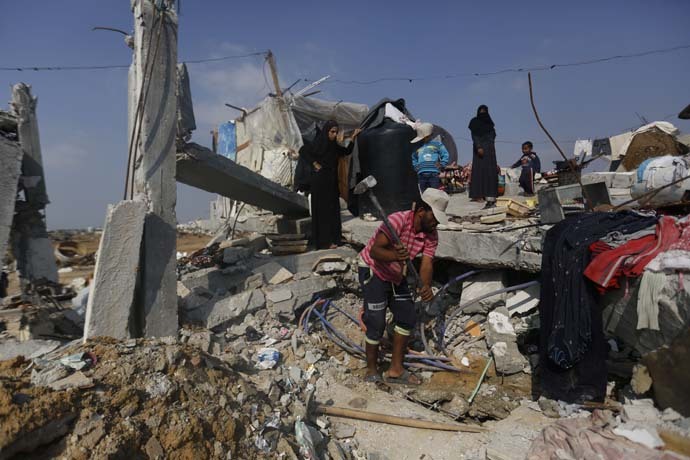 Moeen Mubaiyid's family home is now half rubble, while the other half has big cracks and holes in its walls. Moeen used to support his family by working in Gaza's once thriving construction industry - but like tens of thousands of construction workers he lost his job after the blockade was imposed, and cannot afford to live anywhere else. Now winter is approaching. "It rained for two days and the rain already started to leak through the cracks. We worry what will happen when more rain comes," says Moeen. His wife, Um Ahmed, worries about bringing her grandchildren up here: "They don't feel safe. They look at the cracks in the walls and keep asking me why we have to stay in this house - it's about to fall on us." 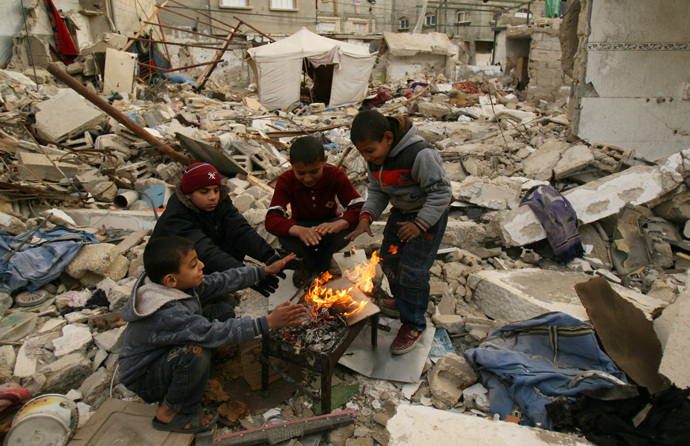 Winter in Gaza brings new threats to families already hit hard by the recent conflict. Kamel Qasem, father of five, clears storm water drains as part of Oxfam's "cash for work" project: Families earn much-needed income, while reducing the risk of further flooding.